Are you ready to learn the wok-dance? In case you’re not familiar with it, it’s the move that comes just before the happy dance you’ll make when you taste the seven delicious, fresh stir-fry recipes. All joking aside, the wok-dance refers to the lightning-fast movements of professional wok masters, who use not only their hands and arms to lift and stir ingredients in a wok, but also their legs – the heat of their gas stoves, often up to 650c, is controlled by a lever near the knee. It’s an incredible sight to see, and a technique that takes years of practice to master. But that doesn’t mean that you can’t create fast, tasty and authentic wok-cooked dishes in your own home this Chinese New Year. We’ve tapped Taiwanese TV cook Ching-He Huang – an authority on Chinese food, and author of Stir Crazy, a cookbook on the art of stir-frying – for her top tips on getting the most out of your wok, and what to cook with it. Stir frying – cooking proteins, vegetables and seasonings over a high heat for a short time – can be both inexpensive and healthy, two things that you can’t always guarantee from your local Chinese takeaway. 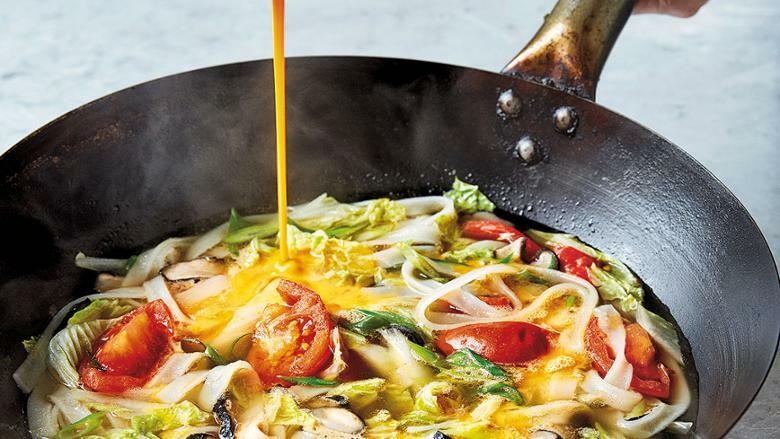 ‘By cooking on a concentrated heat with a small amount of oil you retain more of the nutrients, yet the heat helps to break down the fibres, making the food easy for you to digest and absorb the nutrient,’ says Ching-He. Doing it in a regular frying pan isn’t going to cut it; you need a high-sided wok so that your food has lots of hot surface area to cook on quickly. So your first step is to get your hands on the right wok for your kitchen – the ‘2,000-year-old magical cooking pot’ that she says can be a lifesaver on busy days. 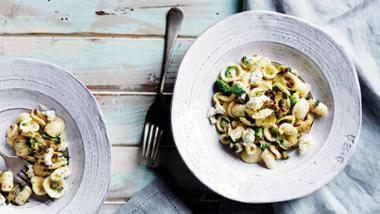 She’s not kidding: The longest cooking time in any of our recipes is 12 minutes, and the shortest? 30 seconds. In the book, she provides an in-depth guide to cooking in a wok, from how to cut your ingredients (divide them into aromatics, proteins and vegetables, and keep each group about the same size if you are adding them together); to what kind of oil to use (and why you should salt it first); how baking soda can tenderise cheaper cuts of meat; and why you need to keep a cup of water nearby to cool things off. 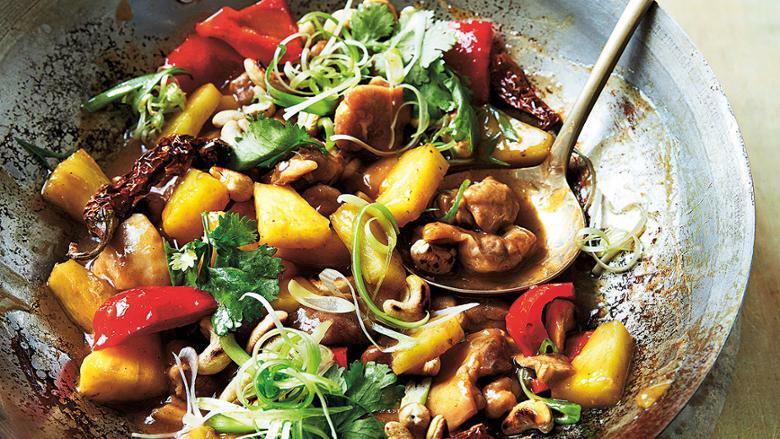 Read on for Ching-He’s guide to buying a wok, and then try one of these recipes. 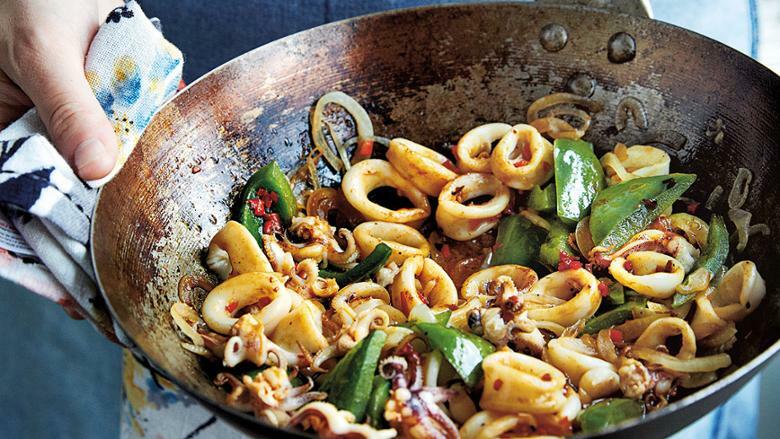 I love how the savoury-sour combination of the oyster sauce and rice vinegar complements the delicate flavour of the baby squid. However, be careful you don’t overcook the squid as it can all too quickly turn to rubber. The trick is to sear it very quickly in a very hot pan. Don’t take your eye off it. Hokkien mee is a Malaysian Chinese dish that is usually topped with meat and shrimp and served on egg noodles. My vegetarian version swaps the meat and shellfish for braised Chinese mushrooms and minced soy protein and, in my opinion, they provide a rich, savoury topping that is just as good. 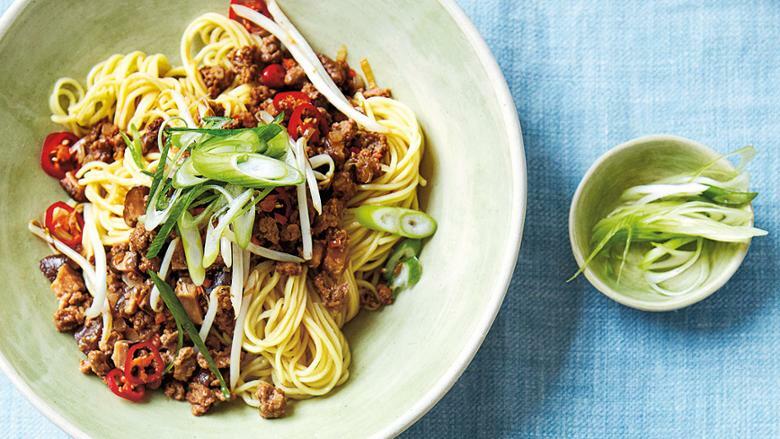 It’s delicious garnished with spring onion, which adds a fresh bite, and a little red chilli for an extra kick. Based on a snack recipe from Northern China, this egg and tomato soup would be cooked with la-mein (hand-pulled noodles) and served from small stalls for breakfast or as a light supper. It was commonly referred to as ‘Egg Flower Soup’, because the egg swirls created a flowery pattern. 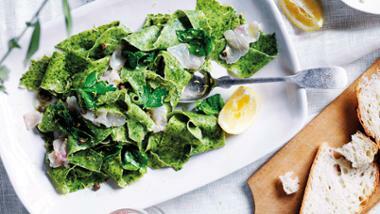 Traditional wheat flour noodles or wide flat rice noodles are perfect for this dish as they have a silky texture. 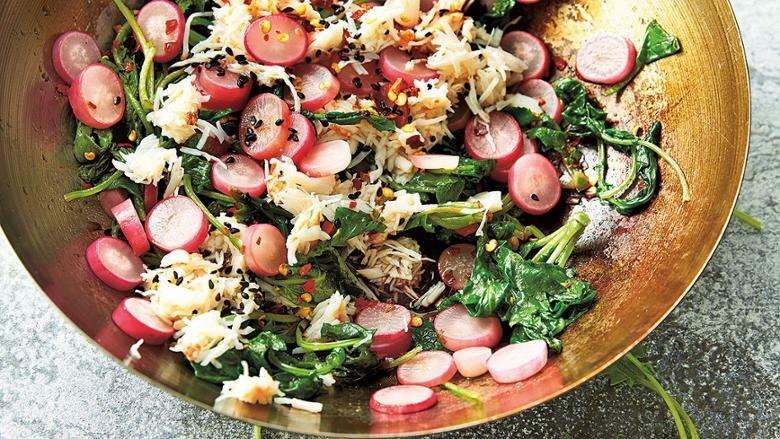 Radishes taste really great when they’ve been lightly stir-fried as the cooking brings out their sweetness, which in turn perfectly complements the sweetness of the crab meat. 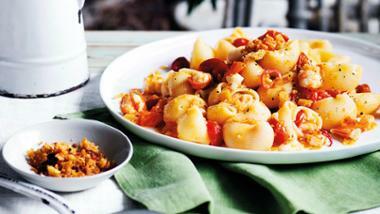 Sesame seeds balance this out with a little nuttiness and the chilli adds a subtle hint of spice. 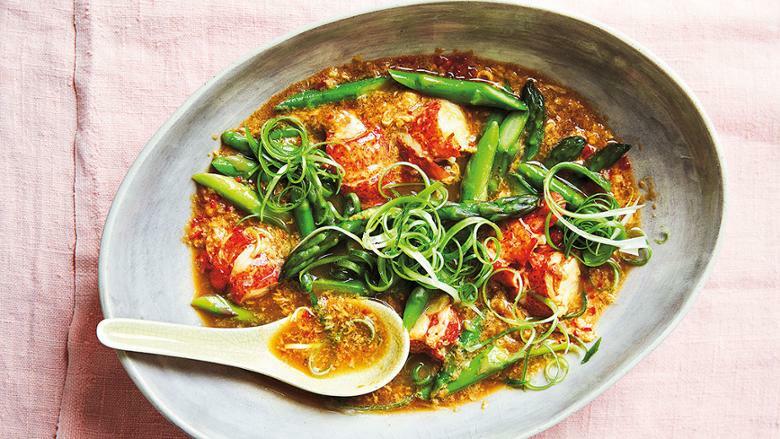 This is a decadent stir-fry using lobster tails and fresh baby asparagus. Pungent and aromatic with a hint of chilli spice, it is perfect for dinner guests and fuss-free to make. You can also turn this into a saucy noodle dish – just up the quantities for the sauce and seasoning, add cooked thin egg noodles at the end and wok it all together. I love this dish because I’m a big fan of fresh, juicy sweet pineapples. This may seem like a long list of ingredients but it’s so quick and easy to prepare once you have them all. If you are vegan, you can use smoked tofu instead of chicken and you could also turn this into a chow mein dish by adding cooked egg noodles at the end, if you wish. 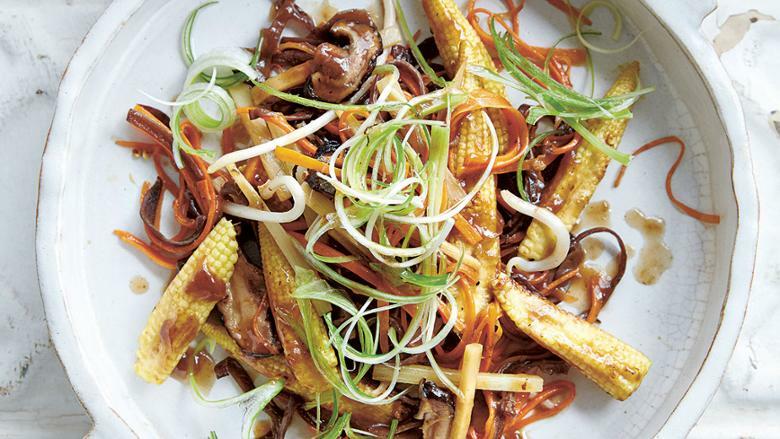 Buddha’s stir-fried mixed vegetables is a famous Chinese dish that is served at all important festivals throughout the year. Typically, a dish such as this would contain straw mushrooms and dried lily flowers. However, you can use a bag of mixed stir-fry vegetables – beansprouts, cabbage, peppers and onions, or any assorted vegetable medley that you prefer. How do I go about choosing a wok? If you are really into healthy eating, I would suggest a stainless steel wok. It can be seasoned with coatings of apple cider vinegar, each coating evaporated to give a clear, thin non-stick layer. However, stainless steel as a material sometimes has uneven heat spots and food can stick, plus it doesn’t retain heat as well as carbon steel. Most professional Chinese chefs use unseasoned carbon steel woks but they need a lot of love and care or they rust. Non-stick varieties, however, are not ideal since the coating comes off with time. Some carbon steel woks have a flat, wide base more like a saucepan, which is not a traditional wok shape, so look for ones with deep sides (to allow you to toss the food) and a small centre (to concentrate the heat). Traditional woks are round-bottomed but these require a wok ring set over your stove, which is another added piece of equipment and not ideal for the modern home,especially induction hobs, which many homes have now. Aluminium woks are inexpensive but they can rust and warp and are not as good conductors or retainers of heat as carbon steel woks. My grandmother used to cook on a cast-iron wok and they are the best, but they are extremely heavy and it can be difficult to toss the food or manoeuvre them away from the hob when the heat gets too hot. If you don’t need to season your new wok, you can go right ahead and start cooking – just use a damp sponge and a little soapy water to wash off any industrial oil, dust or dirt, then place on the heat to dry.